UCO DECOWOOD is a wood-alike fibre cement board where the robustness and rustic appeal of timber combined with durability of fibre cement is inherent. It is ideal for internal and external applications. UCO DecoWood is recommended to be painted to achieve a long lasting natural timber look-alike finish. Ideal for ceiling, feature wall, louvers, decking, staircase risers and threads, skirting/cornice, decking and fencing. Uco DecoWood can be installed on metal and timber frame structures. The spacing of the framing or joint is 400mm – 600mm c/c. 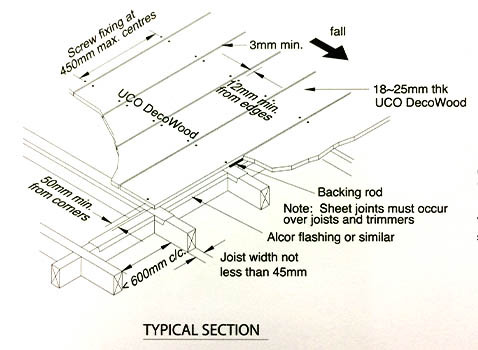 Refer to Uniform Load table for recommended joist spacing. Pre-drill with a smaller diameter drill bit, then a larger diameter drill bit to form 1mm diameter hole larger than screw diameter. For timber framing, fix with timber screw. 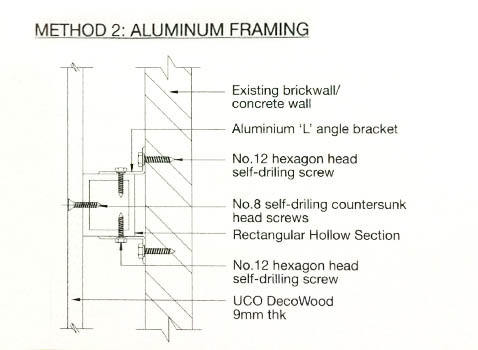 For metal framing, fix with a self-drilling, countersunk head screw, Recommended screw sizes are No.10 or 12 diameter with appropriate length. Screw positions should be at least 12mm from the board edges. Boards should be laid straight and positioned with 3mm min. Spaces in between using either spacers or wedges to ensure the gaps are even. Clean the screw heads, then conceal them with putty/filler. The polyethylene backing rod is installed before apply P.U. sealant or filter at the 3mm min. Gap between two pieces of boards (optional). Smooth the surface of concealed area by using a fine sand paper. Apply Primer with a paint brush over the concealed area before the next painting session. Uco DecoWood can be installed on both galvanized steel stud and Aluminum hollow section as frame. The spacing of the framing is maximum 610mm c/c. 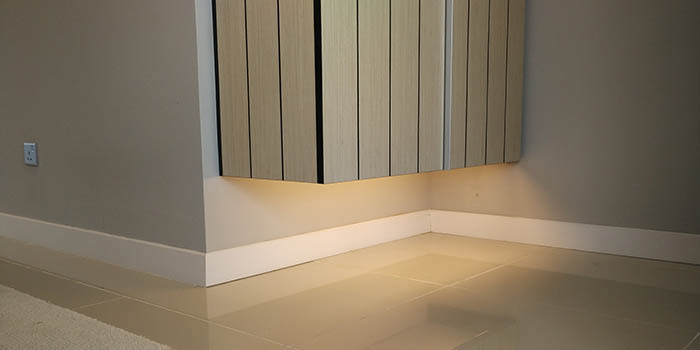 At the beginning of various fixing methods, measure and mark the position of screw holes on UCO DecoWood. Pre-drill with a smaller diameter drill bit, then a larger diameter drill bit to form 1mm diameter hole larger than screw diameter. 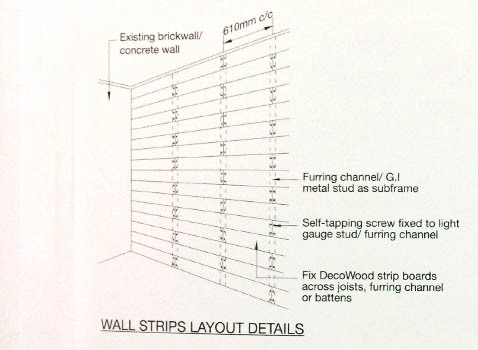 Fix the 'U' track to the wall by using No.10 or 12 diameter hexagon head self-drilling screw. Align the position of G.I metal stud. 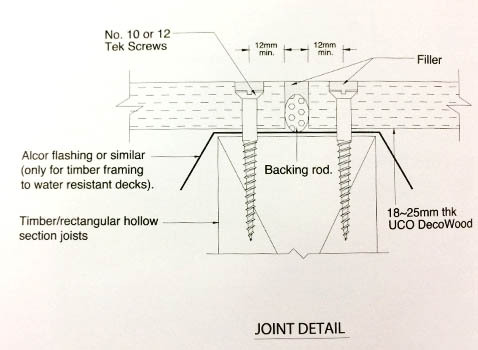 Fix it to 'U' track by using No.8 or 10 diameter hexagon head self-drilling screw. Fix the UCO DecoWood with no.8 diameter self-drilling, countersunk head screw. Screw positions should be at least 12mm from the board edges. Fix the upper Aluminum L-shaped angle to the wall by using No.10 or 12 diameter hexagon head self-drilling screw. Align the position of square or rectangular Aluminum hollow section by using laser measurement tool, then fix it to upper Aluminum L-shaped angle by using No.8 or 10 diameter hexagon head self-drilling screw. Strengthen the position of Aluminum hollow section with lower Aluminum L-shaped angle. Install the wall plug to the marked position on the wall. Fix the UCO DecoWood with No.8 diameter self-tapping, countersunk head screw. Screw positions should be at least 12mm from the board edges.